The four O3b satellites and their dispenser are hoisted in the S3 payload preparation facility (photo at left) and positioned atop the Fregat upper stage (at right). During activity in the Spaceport’s S3 payload integration building, the quartet of O3b satellites and their tube-shaped dispenser system were installed atop Fregat – which is to perform three propulsive burns before deploying the spacecraft into circular orbit during Soyuz’ mission duration of 2 hours, 23 minutes and 51 seconds. Scheduled for a midday liftoff on April 4, Soyuz will deliver a total payload lift performance of 3,198 kg. 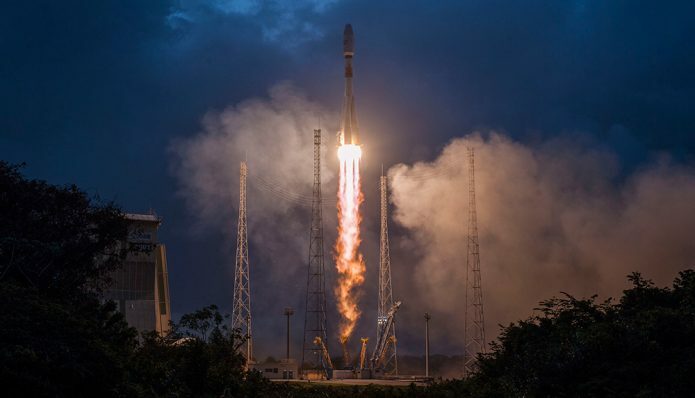 Flight VS22 will be Arianespace’s fifth in supporting SES’ expansion of its satellite constellation. Operational since 2014, the O3b network delivers fiber-equivalent connectivity, and is part of SES’ vision of connecting people and empowering them with opportunities. The first 16 spacecraft for O3b were orbited by four Soyuz vehicles operating from French Guiana in 2013, 2014 and 2018. Each satellite – built by Thales Alenia Space – weighs about 700 kg. at launch and provides more than 10 Gbps of capacity.